In this article I will guide you through the structure of the full-cycle project of design and build of your electronic device. I hope that you will find this article useful, you being an owner of the project, or a part of it. What the project usually begins with? Yes, the idea which you are passionate about; or the need which will help your living. I want to emphasize three traits, which will help you in successful completion of the project: these are passion, persistence and patience. Passion will keep you dedicated to the project, guiding you through the ambiguities of the decision making, and give you an internal feeling of support. Persistence will help you survive whatever bad people would say about the project, and beat the others' unbelief into your success. Patience will make you seeing your failures as milestones to your success, and one of the vital components of your learning. There's fourth trait, which you have to master - ability to listen and get pieces of useful information out of the noise of data you get. Throughout the project planning and execution, listen to yourself, peers, supporters and opponents. While opponents may attack you with confusing messages, you should not take what they say personally, rather think how information you've got from them help you achieving your goal - outcome of your project - faster and cheaper, and what can be changed in the specification for this project to fix unveiled technical issues or market opportunities. However be very careful with specifications - at some point in time it is better to focus on current specification, build the device, and then start new project, otherwise you may risk constantly changing specifications, and never releasing workable product. 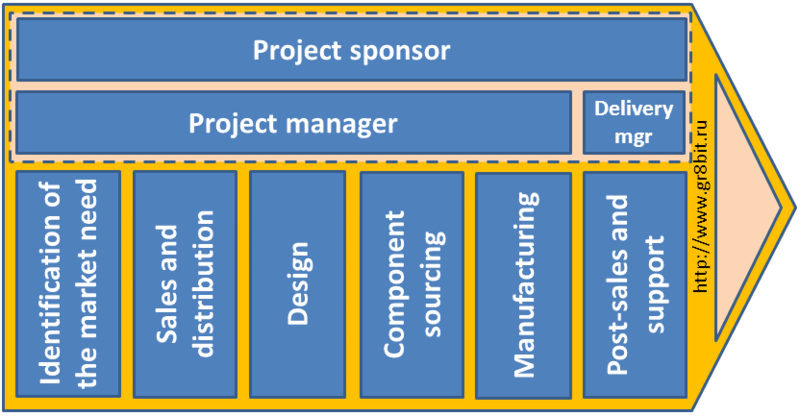 There're several roles involved into the successful project; all these roles can be executed by a single person (you), or you can involve other people doing some pieces of work for you. Sponsor holds the goal of the project and idea of its application. Funds the project, with the future exchange if its results. Results of the project could be self-esteem of having device built, money from selling the device, etc. Project manager is the person responsible for the design and execution of the project, in other words, this person matches what he has on hand - money, time and specification - and translates it into the plan, agrees the plan with all parties expected to execute it and then track execution. It is administrative task, but knowledge of the field of operation - in our case electronics and technologies of design and production of the electronics devices - will be a great asset. Project manager reports project progress to the sponsor. Project team is expected to give inputs on the tasks using their expertise during project planning stages, and is expected to execute assigned tasks and immediately report back to project manager if issues are encountered, and reports about completion of the tasks. Important note, before we will go from theory to the practice, is that project manager is a key person, however he extremely dependent of the qualities of the project team members. If you are project manager, thoroughly assess team members' expertise in the subject you are going to assign to them, and their attitude to the responsibility. Committing someone making specific task to specific time and with specific quality is very uneasy task. Ensure members understand what they are going to achieve, they know how they achieve their task's goal, and regularly check their progress. Failure of project manager on any of these tasks will most probably lead to the failure of the project. Now let's get pack to the core of the article - how do you have device you want built? First, let's consider expertise you will need. I will list several functions, which I think are important for you, in reality you may add more or remove some, considering the risks of doing so. The best is to map functions onto the so called value chain. Project sponsor, project manager and service delivery manager are supporting functions, they are vital for the project, and their activities span all the phases of the project. As I said it could be single person, or even all functions can be driven by single person. Now let's consider core functions in detail. Do I need the outcome of the project? Which my problem does it solve? Who else needs it? Which problems or pain points the outcome of the project will solve? Is the new device expected to fall into the "adding pleasure" category, or "solve pain point" category? In overall, what is the size of the market for the outcome - in other words, how many people or organizations will want the device? How much people or organizations are ready to pay for pleasure or solution of their pain points? Even if you give your work for free, community may expect you still perform support and maintenance for it, and if you fail to do it, you will have your image negatively impacted. This issue can be mitigated by stating "as is" when releasing your work, but who reads license terms and conditions? And at the extreme, if you give away for free, you can just be treated as dupe. If you play role of sponsor of the project, you can set any price for the device - being guided how much time and money you and your team invested into the project. But always remember that there should be the golden mean between customer's ability and wish to purchase your device, and your definition of success (in material and non-material aspects). I put sales and distribution before even design because you should think about how your device will reach customer even before you start designing it. It is very important for hobbyist-type projects, when you invested a lot of your soul into it, but none wants the device or you simply can not deliver device to customers. Sales activity will derive from the previous step, identification of your customer. You will decide how your device will be priced, and how you are going to get the amounts. Will you serve specific geography directly, or through partner/dealer - and how much third party's service will cost? One important note: ensure that you will be able to manage money you receive, and you will not end up with them being on account, but win no possibility to withdraw it (example: Paypal in Russia). Distribution is how your device will reach your consumer. Will it be direct shipment (which provider for shipment and which provider for customs if required), or through warehouse (e.g. friend who will receive a number of devices and then will distribute them within his geographical region). Now we come to the design stage, when you start thinking about technical implementation of the idea. Here you will need deep technical skills, and also business skills to identify most feasible technical solution for complexity of implementation and cost. Rebuild already existing device, leaving circuit diagram intact, probably modifying component base and optimizing board layout. The advantage of this approach is that original ROM (firmware) will work with your board, and you will not need a lot of programming and compatibility issues between devices (if we talk about cartridges for MSX - between device and MSX machine). The drawback is that it could be hard finding original components, and ROM image could be copyrighted. Build your own device, using some pieces of work of others. The same a above, you need to ensure copyrights are not violated. Plus, you should ensure interoperability of the pieces you reuse. Build your own device from the scratch. You will have full control over intellectual property, but the drawback of such implementation will be creating firmware for the device, creating software for the board, and ensure distribution of the software along with device, and support of the software. There's also one thing which you should take into account when reusing someone else's design. Documentation of the design may contain mistakes and errors. Thus before you use it, ask someone knowledgeable to validate the schematic diagram, or, if you are lucky to have board with circuit already implemented, manually track connections of the modules involved. It is time consuming and uneasy job, but you then will be 100% sure that you do not have errors in your design. Let's imagine you designed the board, you are sure that it should work, and that you can source components for it. Next stage is component sourcing: integrated circuits, connectors, transistors, resistors, capacitors, sockets, diodes, quartz resonators, jumpers, resistor packs and cables. Printed circuit board is also a component. I recommend building prototype first, in quantity of two (2). It will cost a little more than immediate batch of 100 pieces, but you will minimize risk of you sitting and reworking 100 pieces if you find a problem in your design. For the prototype you can re-use used components, given that you are 100% sure they are operational. But again, having some integrated circuit on 20-year-old board available for testing does not mean you will be able to source new now. Disoldering components of the donor devices requires desoldering skills and desoldering equipment - at least hand suction device, and soldering iron with adjustable temperature of the nozzle. Before sourcing non-standard and rare components, talk to community and seek for advice where you can reliably get them functional. There were cases recently when ordering online people were getting fake Yamaha chips which did not work or did not work properly. For example, I have one friend who has relationship with Chinese supplier, and we had a case I have got chips which did not work properly, and supplier sent me another batch of working ones for free - and I am very grateful to supplies and to my friend. Manufacturing stage is the one when you catch errors related to the placement of the components and labels. EDA tools like EAGLE usually checks for different types of errors, but it may happen if you used non-standard library component or created it yourself. That's why it is vitally important you have prototype first, and final batch next. I did this way with GR8BIT, and, after catching several serious mistakes and wrong assumptions with version 0, modified the design and built the product which was working without manual rework. After manufacturing you return to already decided sales and distribution. You should know who your customer is, how much you will be paid, which payment channels are to be used, and how you distribute the device. Then last stage in your device's lifecycle begins: post-sales and support. It is vital stage if you want your customer to return to you for next projects. A lot of great projects died for very simple reason: something was wrong with the device, or customer has a question about its operation, and developer failed to properly respond. Word of mouth spreading quickly, especially negative one, and you may soon be labeled as having unsuccessful project because someone is left alone with your device. That does not mean you should satisfy everyone and every request; it means that you should watch how your products and customers are doing with your product. Negative feedback usually very useful and important than positive, thus do not take it personally, try getting a value from it for yourself, current and possibly future products and devices. And final word about your project. Every product has its lifecycle, and most of them eventually end up in scrap-heap. Your goal is to give your customer best value of using your product, and do not feel sad when product is decommissioned. The most important is what your customer says about using your device, their memories of it and of dealing with you. And hopefully, they will return to you for something else. End of KB0017 "How to successfully design and build your own electronics project".